A laminated copy of this article was loaned us by Frank Copy to use in putting this article on the web site. Many thanks to Mr. Dawson. 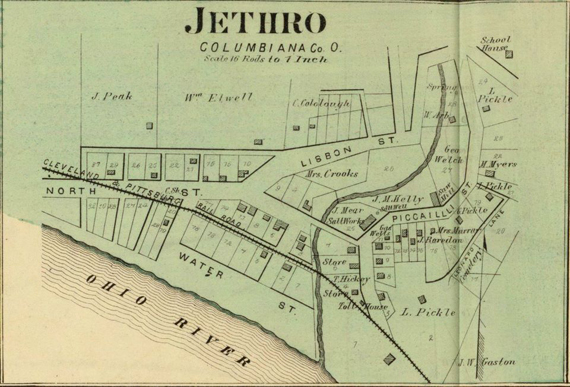 Situated below the railroad tracks running through East Liverpool and Wellsville, the largest sewer pipe manufacturing plant in the nation once loomed for about a mile, overlooking the sparkling waters of the Ohio River. The community that once was home to the Walker works manufacturing plant has since been forgotten around the area. 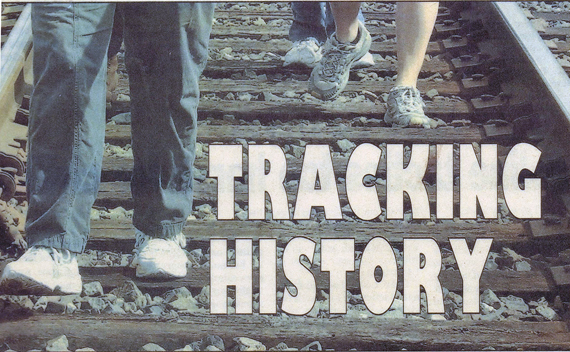 One day this spring I joined a historian, high school student, and a funeral home owner and his wife as we walked along the railroad tracks, determined to revive history through the remains of what was once a booming economy. On the way to find some proof of the manufacturing plant's existence we encountered a number of landmarks, many of which carry great historical significance even though they may have been forgotten by the local community. Leading the journey was funeral home owner Frank Dawson and local historian Joan Witt, both of whom had tread the path before during their youth, not so many years ago. After a limousine ride from the Dawson family center, the journey began on the train tracks along River Road. With many in the group, namely me, high school student Amy Dunlap, Gretchen Dawson, and Stephanie Angelini, beginning to feel a little anxious about the journey along well - traveled tracks, which appropriately told three stories a man who died in the 1800s near that very same location. Witt's first account stretched back to the year 1861 and told the story of East Liverpool's first known murder. According to historical accounts, Christian Olsen, who was known in the area as "The Flying Dutchman," was shot through the heart the night of June 4. His body was found along the C&P Railroad tracks near the mill of Jackman Frederick and company. Olsen is said to come to town in hopes of finding a workshop to build a "flying machine". Historical accounts indicate on the night of Olsen's murder, he had just finished his creation, described his wings that worked with wound up coils of Springs, he was celebrating his success, according to the account, but little else is known of the circumstances surrounding his death. The murder was never solved as the coroner's verdict was Olsen met his death at the hands of a person(s) unknown. Police believe the murderer, in order to escape detection, placed Olsen's body on the railroad tracks where it was hit by a train, severing his head from his body. Witt followed with two more stories, which appeared in October additions of the 1880 Saturday Review. On October 9 the body of Thomas Cartwright was reportedly found lying near the track, about 30 yards below the crossing. The newspaper account indicates Cartwright arose at an early hour confused and intending to go to the pottery where he worked. The victim apparently thought he was heading to work from his Market Street property, which was located just a few feet from the railroad crossing. Cartwright was struck on the crossing around 4:30 AM and was dragged some 15 - 20 yards, lacerating both arms and legs, and severely wounding his head. His body was then picked up and taken to Wellsville were officials told train operators the body belonging East Liverpool. The newspaper account indicated Cartwright believed he was still on his own property at the time of the accident. Witt's final railroad track story involved the death of Jonah Jones, which occurred just seven day's before Cartwright's accident. The newspaper account depicting his death indicated Jones was hit by freight engine while he slept on the tracks and apparent intoxicated state. Keeping a careful ear for trains in the distance, the walk proceeded and we encountered numerous historical landmarks. 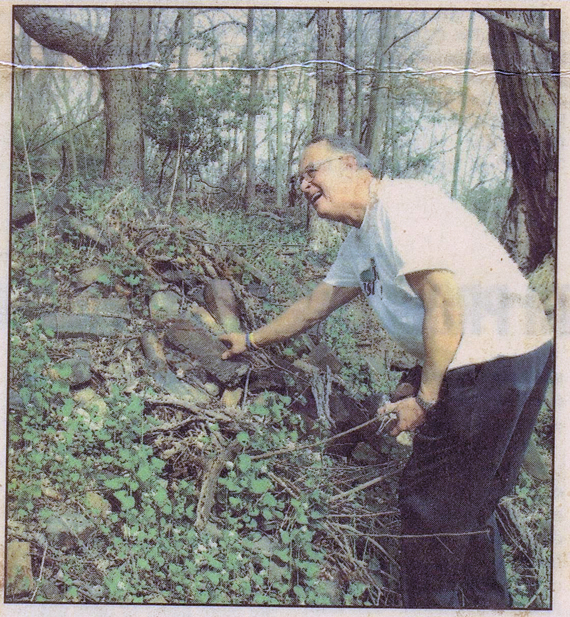 After picking up a number of various artifacts - train track bolts, electric pole lights, rocks - and hearing Frank Dawson yell "N. U. Walker" about 15 times describing each brick he picked up, we stopped to look out over an embankment closed W. 4th St. Dawson and Witt pointed out what is believed to be the former location of the W. E. Golding and Son's Co.
Operating in the area from 1876 to 1937, Golding's produced ground flint and feldspar for the Western pottery district. Combining those two components with talc and ball clay, Golding's is known for producing the world-famous Rockingham Yellowware. Not long after passing the area were Golding's may have sat, we descended into an area called Jethro Hollow, located at the far West End of East Liverpool. Jethro is thought to be the area were an early community figure named Leonard Pickel settled in the 1830s. 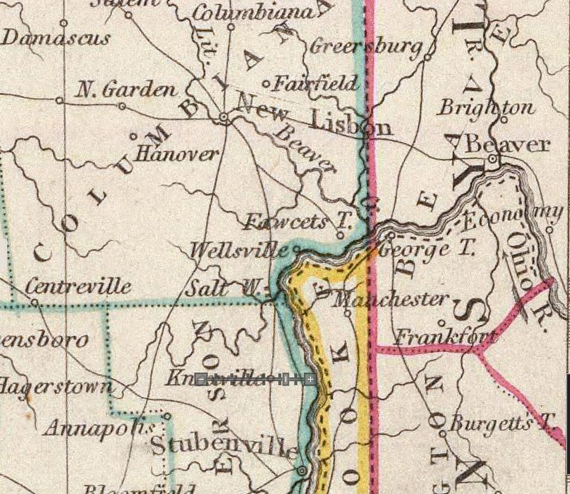 According to old newspaper accounts, Pickel moved to the area just a little more than a decade after the death of Fawcettown's founder Thomas Fawcett. His original home, built near Jethro, was actually just a stone's throw from Fawcett's homestead. The steps that led to Fawcett's mansion have remained through the years leading the way to the location of a former cornerstone mansion of the community. Over the next years after his arrival, Pickel reportedly acquired much of the land in the Jethro community, erecting at least a dozen houses, from which he collected rent. To ensure that his name would remain etched in community history, Pickel laid out "L. Pickel's addition" using the property acquired from Jethro. 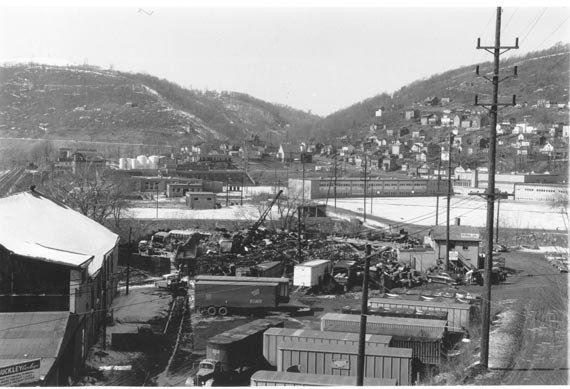 The addition stretched out in a long, narrow section across East Liverpool - Wellsville road into the lower section of Jethro Hollow and was home to at least 10 of Pickel's family members. 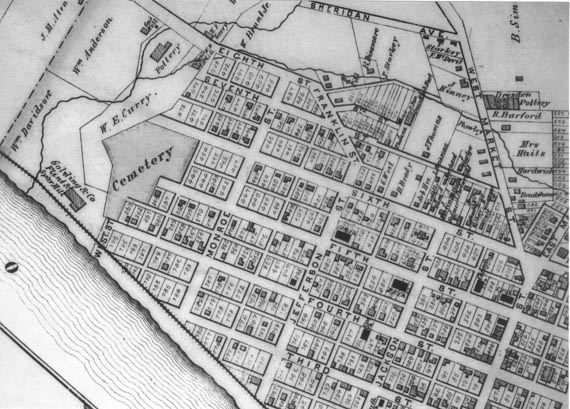 To streets in the area still bear the early areas figure's name: Leonard Street, one of the principal roads in the riverfront community and Pickel Alley, the only pathway leading to Jethro. Just 25 years before he died in 1885, Pickel build his own Jethro Hollow home with a sweeping view of the river. His was the first home which use gas as fuel, after the first gas well was struck on his property. Pickel died November 24, 1885, of what was thought to be a heart attack. His grave still stands in what was a family cemetery overlooking the 120 - year - old Jethro neighborhood. One legend indicates the man dug his own grave, however, this is not entirely true. 6 to 10 years before his death, Pickel reportedly purchased his own gravestone and had all the vital statistics cut in except the date death. He supervised the gravestone's erection where an underground vault was constructed to receive his casket. Formally surrounded by a number of other stones, Pickel's grave was undoubtedly one of many family cemeteries in the area, which has sense been outlawed. The other graves of the cemetery have eroded away over the years even though the cemetery still appears on county records. 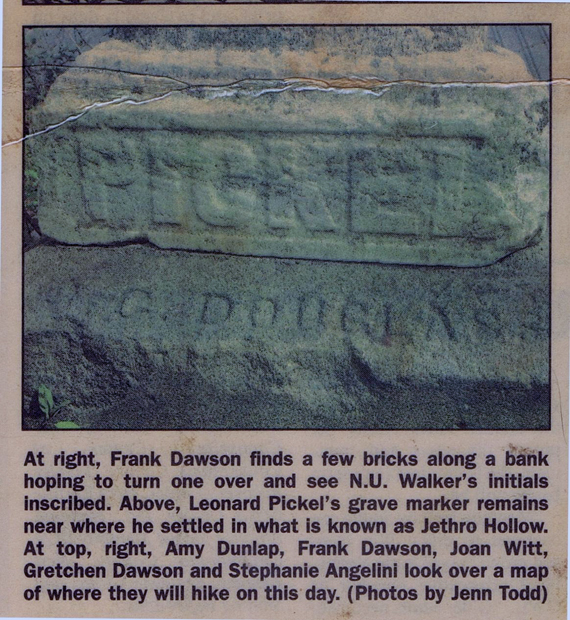 Today the stone is barely legible and Pickel's name is one of the only etchings which can still be deciphered. A name, "Douglass," is the other legible script on the gravestone and it is thought to represent the name of the tomb's designer. Descending down from the Pickel grave site almost completely enclosed and brush, we made our way back to the tracks in search of the remnants of what was once the largest sewer pipe manufacturing plant in the nation. Picking up bricks along the way, hoping to find N. U. Walker's initials scripted on the front, we trudged along, peering down toward the river, expecting to see some indication of the civilization which thrived in the area. Engulfed in the search, four of the five of us explored close to the river while one, Angelini, forged ahead. That's when the words, "N. U. Walker"rang out in the distance indicating Angelini had found sewer plant's remnants. Satisfied with our discovery, we gathered up some mementos from the site and started back up the Hill to route 7, where limousine was waiting to drive us back to the Dawson Family Center. While it was last trip to the remains that some in the group would take, the history of Walker's will live on in exhibit house at the Museum of ceramics Downtown.